Food Network is hosting a “Summer Fest 2011“ this year and I am so excited to participate in their event and share my Summer Fest recipes with you all. That means every time when I participate in the Summer Fest, my recipe’s link will be shared on Food Network!!! I am just soooo thrilled to be a part of something which is hosted by Food network…wohooo!! So this is how “Summer Fest” works. Every other week we have to create and publish one recipe using a main ingredient given by food network for the Summer Fest. How exciting and challenging! This week’s main ingredient is “Cucumber“. Till yesterday I was like ahhh..it is just a cucumber I will just make ______hmmmmm…..I was actually blank! I knew I can make raita, salad or my mom’s cucumber curry out of it. But I wanted to create something different that I have never tried before. So after getting some inspiration from other food blogs and tastespotting, finally I figured out that I should make Gazpacho! Which is totally refreshing, perfect for this HOT summer and on the top of it, it is very very easy to make. So what is Gazpacho? Gazpacho is a cold Spanish soup made of raw vegetables, herbs, spices and a bit of pure olive oil. It was originated in Spain. To make Gazpacho, all you need to do is to blend some fresh vegetables in a blender, add some spices, herbs and let it chill in refrigerator for an hour and it’s ready! 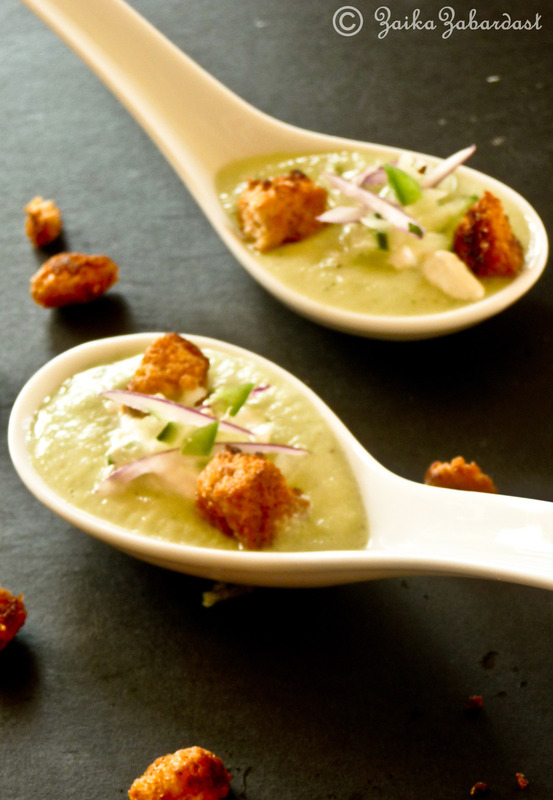 So this is what I came up with – Cucumber Gazpacho with spiced croutons. I made cucumber gazpacho with avocado, garlic scapes (fresh mild garlic) and jalapeño to add some spicy kick. 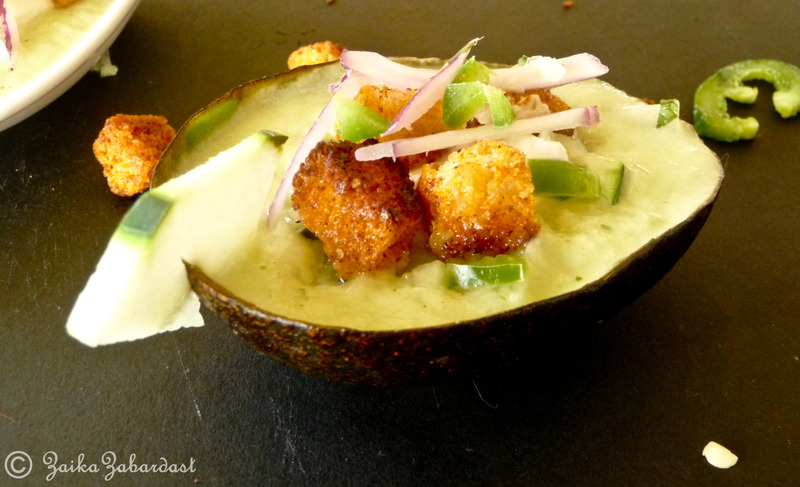 Avocado gives it a nice creamy texture as well as it works as a natural soup thickener. I have also used some fresh mint and freshly squeezed lime juice to balance the flavors. Traditional recipe of Gazpacho is based on tomatoes and other fresh vegetables and they use stale bread as a natural thickener(WP). To garnish my Gazpacho, I prepared some spicy croutons and jalapeño spiced sour cream. Croutons will give it nice crunchy texture and sour cream will make it bit more creamy. But sour cream is completely optional. 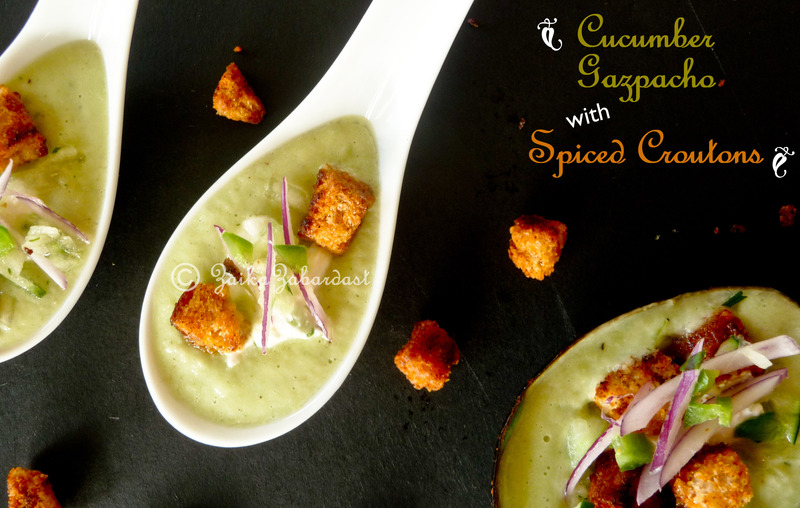 I hope you will enjoy my recipe of Cucumber Gazpacho in this hot summer..it is perfect for lunch/dinner 🙂 All you need to do is blend some vegetables in a blender along with some spices and herbs and let it chill in refrigerator for an hour or so and your lunch/dinner is ready. How easy is that? In a blender, blend all the ingredients. 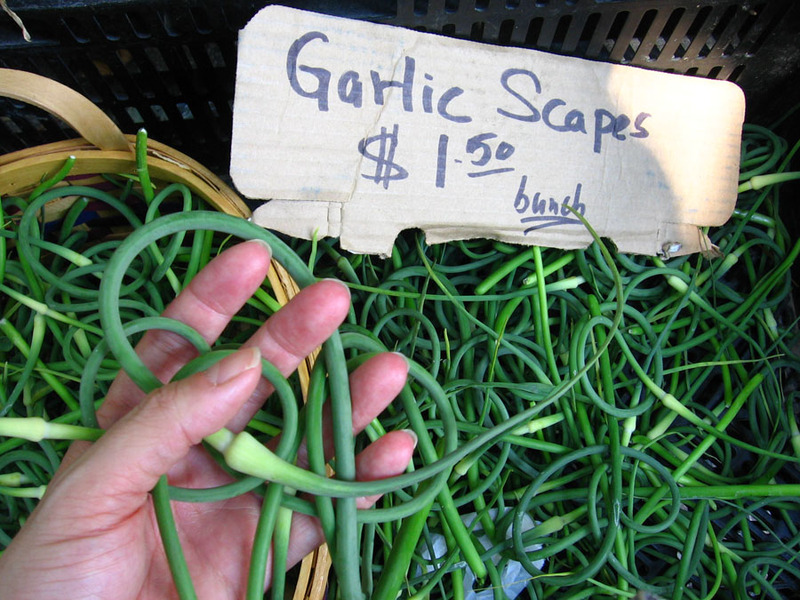 Season, to taste, with salt/pepper. Cover and refrigerate for about an hour or until next day. Serve it with spiced croutons and a dollop of jalapeño spiced sour cream. Enjoy! Spiced Croutons – You can make this a day earlier and store it in a air tight container or you can use store-bought one. Heat the butter in a saucepan or straight-sided skillet. Add bread cubes and saute, stirring constantly, until lightly browned. Season and serve. Mix jalapeno and garlic salt with sour cream. And serve over the cucumber gazpacho. If you are a food blogger and if you are interested to take part with us in a Summer fest, got to http://blog.foodnetwork.com/fn-dish/2011/06/17/summer-fest-is-about-to-begin/ for more information. July 6: Peaches – missed this one too!! Thanks a bunch for sharing this info. The Gazpacho looks so inviting. I make a similar one that is South beach diet friendly without bread. Lovely pictures. Cool site! Found you through my friend’s blog. This recipe looks awesome (and vegetarian, yay!). Thanks for sharing. This sounds really tasty! I made a Persian cucumber soup a couple of days ago (coming soon to the blog); it’s nice to have more options for all the cucumbers around right now! I was never a fan of cold soups until I had gazpacho couple of weeks ago. I fell in love instantly. Like the concoction of flavors in this soup and that spiced crouton sounds like gourmet food.. YUMM.. I am glad that we found each other via Summer fest, looking forward to keep in touch with you.